Thera Band Exercise Balls are inflatable balls used to strengthen postural muscles to improve posture and help prevent back pain. They also increase range of motion, strength, and endurance as well as active stretching, active exercise and aerobics. Each exercise ball comes with two plugs and an adapter, along with the Thera Band Exercise Ball Guide poster containing 24 exercises. 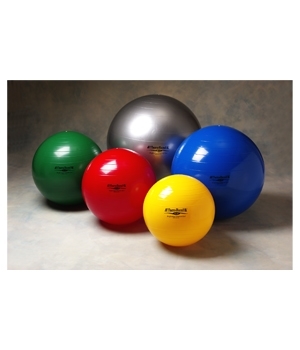 *Please note that our Thera Band Exercise Balls do not come with a pump. However, Foot Pumps and Hand Pumps are both availavle for purchase. I got the yellow ball. it is perfect for what I needed it for.